This article endeavors to find the best of the best affordable small speakers on the market today. 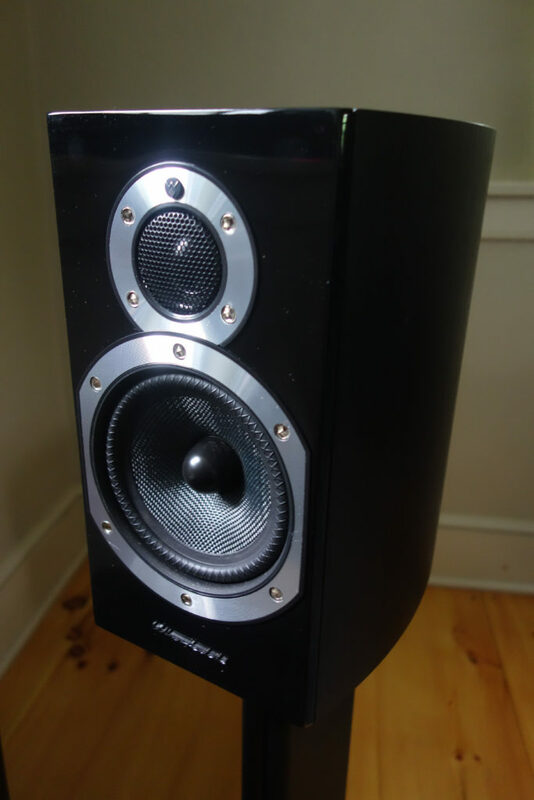 The models I selected for this effort are among the best budget bookshelf speakers as reviewed in reputable audio and home theater publications. A few of them have been reviewed by Stereophile magazine or are among the collections of speakers owned by Stereophile reviewers. One, the Dayton Audio B652-AIR ($49/pair), is the least-expensive speaker Stereophile has ever reviewed. I also took into account the opinions of some of the more articulate and detailed contributors to audio and home theater forums. These five are but a few of the low-cost small speakers on the market today. Others on the market include those from such familiar names as Polk, Sony, Yamaha, MTX, Audioengine, Micca, Music Hall, JBL, Cambridge Audio, Klipsch, and more. I purchased all these speakers myself for review, and plan to sell three or four pair. With the exception of the Dayton and Pioneer, I purchased all of them from Amazon.com. Each can be found for less than $300 USD per pair, and two of them can be had for around $100 or less. In compiling this review, I have a few potential audiences in mind, focusing on budget-conscious music lovers and home theater enthusiasts. I’m particularly thinking of those interested in assembling a cheap two-channel or home-theater setup around the best small speakers available on the market. By virtue of their size, these small speakers are going to be best suited for small- to medium-sized living rooms, family rooms, home theater rooms, or offices. Incidentally, a few of the smaller speakers I review here could also work well in a two-channel setup connected to a home computer or laptop via a small amplifier. Later in the review, I describe A/B comparisons using some of my favorite CDs and LPs. Still further on, I talk about which of these relatively cheap small speakers I ended up enjoying the most over a six-month period. First, here are the specs and a quick overview of each model. The Pioneer SP-BC22-LR, from the famed Andrew Jones, is a rear-ported speaker with 4″ woofer. Weight: 9 lbs. 2 oz. The Pioneer SP-BS22-LR is an affordable budget bookshelf speaker designed by acclaimed audio engineer Andrew Jones. At just $129/pair, it is the second-most affordable speaker I reviewed. It features a 4″ midgrange/woofer driver and high efficiency soft-dome tweeter. The cabinet has an eye-pleasing boat-hull shape, and an oval-shaped grille that exposes the outer edges of the front baffle. Its bass does not reach as deep as the Elac B6 or the Wharefdale Diamond 10.1, but it makes up for this in remarkable transparency, soundstage, and detail. In my listening tests, it proved to be a top speaker for the money on highly detailed classical, jazz, and folk music recordings. Stronger pop and rock music recordings found me opting for some of the larger speakers in this lineup. The Pioneer sells through mass-market brick-and-mortar stores like Best Buy, where I got my pair for $65 on clearance. A matching center channel speaker is available for home theater applications. The Elac B6 is another contender for title of best budget loudspeaker. It is also designed by the acclaimed Andrew Jones. The Elac B6 is another budget small speaker designed by Andrew Jones. At $229/pair, it sits right in the middle of price range of speakers in this review. They are traditional-looking, boxy bookshelf speakers, in contrast to some of the more modern, boat-hull shaped speakers in this price range. The finish marks easily, so treat them with care. They were a bit large for the Sanus stand I was using, and they’d probably be too big for most bookshelves as well. I would consider investing in larger, sturdier stands for these somewhat heavier speakers. The break-in period seemed longer than usual for these speakers. In early listening tests after a 10-hour break-in period, they did not perform favorably compared to other speakers reviewed here. I was able to drive them to louder levels (subjectively measured) than others in this review. There’s a matching center channel speaker available for home theater applications. The Wharfedale Diamond 10.1 is one of the more expensive among the contenders for best affordable small speaker. The Wharefdale Diamond 10.1 is probably the most attractive speaker in this lineup of low-cost bookshelf speakers. Grille-off appearance is that of a much more expensive speaker. The fit and finish are high quality. It looks and feels substantial, despite its small size. The 10.1 is also bi-wirable, a feature not typically found in small affordable speakers. The binding posts are angled for easy access. In my listening tests, they proved to have an engaging sound, if one that slightly emphasizes mid-bass frequencies. The Wharefdale Diamond 10.1 is bi-wirable and features easy-to-use angled binding posts. The KEF Q100 is a highly detailed bookshelf speaker from the regarded British loudspeaker company. The KEF Q100 is one of KEF’s more affordable speakers, borrowing technologies from more expensive kin. The speakers are a conventional box design, but with deeper cabinets than the others in this review. They are a bit front-heavy, so be careful how you place them on your stands. Speaker binding posts are large and easy to use. There is a knob on the rear panel allowing you to switch between single-wire and bi-wire mode. 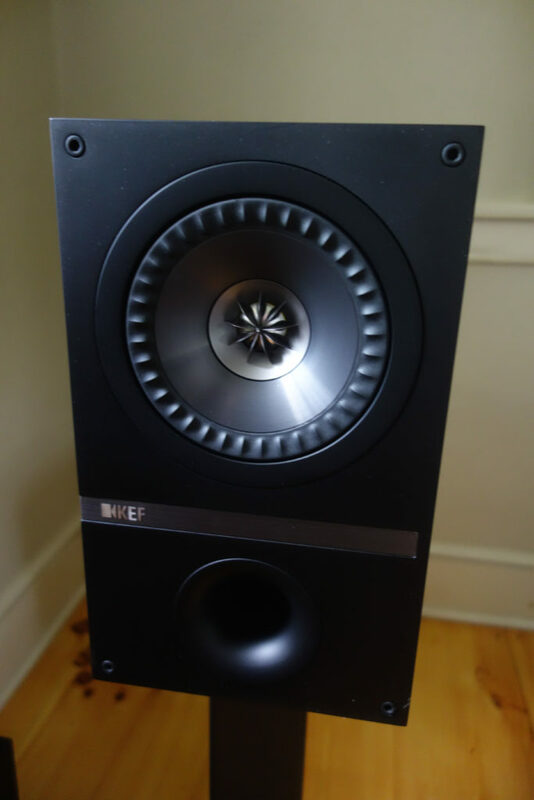 The KEF Q100 are among the more detailed speakers I consider in this review, but in longer listening sessions, they proved too bright for my taste on some material. The Dayton Audio B652-AIR is a great little speaker for the money. This ultra-affordable bookshelf speaker comes to us via Dayton Audio, a familiar name in the world of mail-order speakers and speaker parts. This is a surprisingly detailed and transparent speaker performing well beyond its price point of $49/pair. It hovered around #3 in the results of my A/B listening tests, explained below. 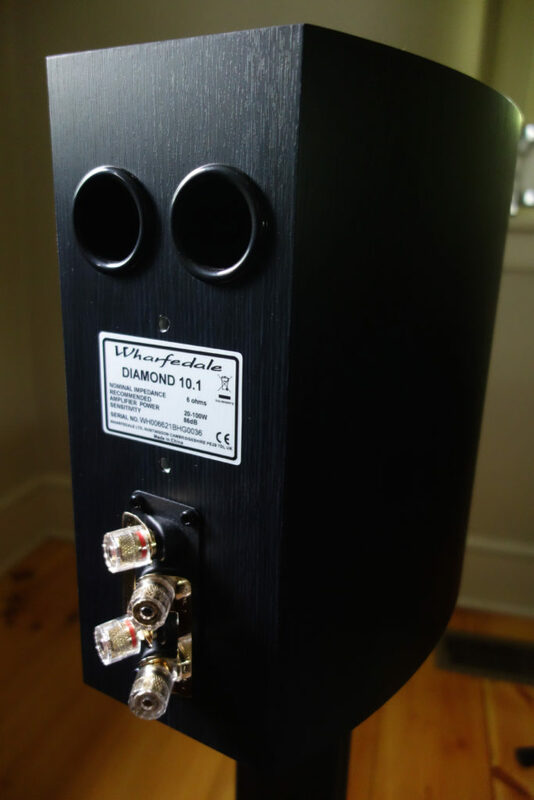 It is a simple traditional rectangular sealed cabinet (no port), with spring terminal speaker connections, the only speaker in this review with such connectors. The connector openings are barely large enough to accept the chunky Monster Platinum XP speaker wire I used in the reviews. They are lightly packaged for shipping. The corner of one speaker was crunched upon arrival. They Dayton is the only speaker in this bunch to offer spongy feet on all four corners of each speaker. Nice touch! For phase one of this review, I compared speakers the speakers a track or two at a time on six of my favorite CDs and LPs. I wanted this phase to approximate the experience of sitting in a hi-fi store with unlimited time and access to all these speakers, having brought a stack of some of your favorite music for comparison. I had all five pair on hand for this phase. After I listened to a track or two and took my notes on one pair, I’d simply get up from the listening spot, disconnect and remove the speakers from their stands, and mount and connect the next pair. All were driven by Denon AVR-S700W 7.2 channel home theater receiving using Onkyo C-7030 as CD source and Onkyo CP-1026A Turntable as vinyl source, using the phono pre-amp section of a Rotel RA-935BX Amplifier. 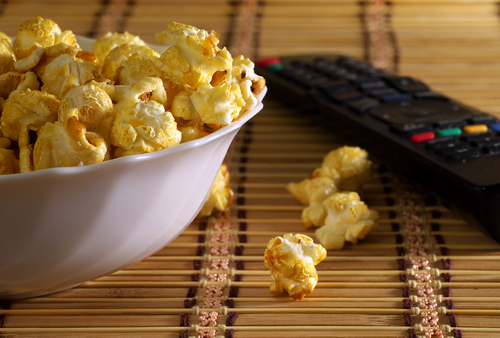 This represents a fairly affordable mix of electronics both new and older, perhaps not unlike you’d see in a typical budget home theater or two-channel setup. Sanus BF24B 24 Inch Speaker Stands ($46 on Amazon.com) were used exclusively, along with Monster XP Platinum speaker wire. Many of the tests used the 250-watt Yamaha SW315 ($295 on Amazon.com), since I’d reckon that many using speakers this size will tend to use a subwoofer to shore up the bass. All listening in this phase took place in my living room, which is 25′ deep and 15′ wide, with 8′ ceilings. A partial wall separates it from the adjacent kitchen, for an overall space of approximately 1000 square feet. It was a somewhat painstaking process to evaluate speakers in this fashion, but I felt it was the only way to begin to understand the differences and strengths and weaknesses among these speakers, which by the way are all high-quality and sound great in their own right. Truth be told, you really can’t go wrong with any of these speakers. Following the write-up of my impressions of each speaker on a given piece of music, I provide a purely subjective ranking that I jotted down after that round was complete. In this section, I present my notes from sessions which spanned over the course of approximately one week, in which I listened to the speakers as described in the methodology above. I have them toed slightly inwards towards the listener, which is where they seem to sound best. Bass is well to the left in the soundstage. Nice pace – this stands out. Percussion sounds a bit “recorded” and one-dimensional. Drake’s voice is much more prominent and detailed as compared to the Elac B6. I am noticing the subtle warbling in his voice. The guitar has much more sparkle and whirl of overtones, and subtle crescendos are more noticeable. Overall, a smoother presentation. These sound best pointed straight at the listener. The soundstage is wide, but not as deep compared to the Elac or KEF. The crescendos are restrained a bit, as compared to the KEF and Elac. They have a lush, rich sound, but I still prefer the detail of the KEFs so far. The Pioneers offer excellent instrument source separation. The percussion has a dimension to it that I didn’t hear in the first three speakers. Instruments and vocal just seem to hang there in space; after all, perhaps this is what Drake intended. I’m hearing a glimmer from the guitar strings not heard in the other speakers. Drake knew how to manipulate shades of darkness and light to his advantage. “Drake’s vocals unbound.” It was through these speakers that I first began thinking about the melancholy and regret in his voice as he sings “could have been one these things first.” The Daytons cast a super wide soundstage, the widest of the bunch, and are capable of playing at surprisingly loud levels for speakers their size. The sound slightly more “cardboard” than the speakers. This is a piece that MUST be played with the subwoofer on. I’m a sucker for these big, lush, overtone-laden productions. The speaker baffles are parallel to the back wall. Again, a nice wide soundstage from the Daytons. The Cowboys are playing with passages of loud and soft, and letting them run over each other at times. Margo’s voice is full and broad, though somewhat veiled. There’s quite a bit going on in this recording – all sorted out very nicely by the tiny Dayton Audio. It picks up on all the stops and decays. I’m hearing the pitter-patter of the footsteps of the chase described in the lyrics. I accidentally let the CD run into the next track: “Floorboard Blues.” (Do yourself a favor and make the same mistake.) Never a track I’d paid much attention to, it shows the Dayton’s ability to layer instruments and voices front to back. And the swirl and growl of that bass – enough to bring the sturdiest to his knees. Then there’s Margo’s voice, as enormous, full, and rosy as you can imagine. Am I actually listening to $49 speakers? For this session, the speaker baffles are parallel to the back wall. I’m hearing more shimmer & sparkle than I heard on the Dayton. Margo’s voice is less defined than the Dayton, but the step-down of “got and new boyfriend and they’re getting along” really stands out. The Pioneer a tiny bit more confused than the Dayton in busier passages. These are toed-in slightly toward my listening position. The Wharfedale is a bit more confused in busier passages as compared to the Dayton. Overall, they glimmer less than the Pioneer. Margo’s voice is huskier. I like it. They seem to err on the side of smoothness versus contrast. This speaker is capable of some decent volume. The opening guitar wail will give you an ice cream headache you if you’re too close. As with the Daytons, the KEFs render instruments cleanly in open space. (The compact, solid enclosure probably helps with this.) The percussion is a bit on the bright side through the KEFs on this particular recording, a fault that’s easily forgiven in light of the speaker’s host of other virtues. On the next track on the CD, “Floorboard Blues,” the KEFs paints the most realistic picture of Margo’s voice of those I’ve heard so far. The Elac B6 is noticeably bassier, but not necessarily bigger sounding than the KEFs. Electric guitars slightly less forward in the mix as compared to the KEFs. Switching the Elac to cross to the sub at 120hz made them somewhat more listenable, but I continue to be disappointed with the midrange detail of the Elac compared to the others. The Elac B6 casts a nice wide soundstage. There’s not as much detail and vocal separation as I’d like to hear. The oboes sound a bit one-dimensional. While not presenting as wide a stage as the Elac, the KEFs once again prove more detailed, here through complex multi-vocal passages. I love hearing the throaty lilt of the oboe. Here again I find a favorable comparison between the KEF and my long-term standby, the Rogers LS7t, with the KEFs getting a slight edge in immediacy of presentation and flexibility in placement and listener position. Nice instrument and vocal separation, rivaling or slightly bettering the KEF. Excellent dynamics. It’s a very pleasant and emotional experience. The Wharfedales are doing a good job of sorting out the complexities of the counterpoint. The Pioneer is exhibiting good detail and separation, though not as strong in those regards as the Wharfedale. I’m hearing decay in vocals and instruments like I haven’t heard in some of the other speakers. There’s nice detail and strength in the oboe, which can tend to get lost through less articulate speakers. I’m sensing lower overall dynamics compared to the KEF and Wharfedale. Still, the Pioneers are a very pleasant and engaging listen. The soundstage is a bit flatter top to bottom than all the other speakers. It has less low-end (smallest box, only sealed configuration in this group), and it’s seemingly the most trebly of the group. The oboe has nice articulation. There’s a surprising amount of detail – down to the rasp of the cello. It’s very listenable, but not at the top of the bunch on this recording. For this track, I listened in pure two-channel configuration, with no subwoofer. The Dayton is casting a very wide soundstage, consistent with my earlier findings. There’s lots of detail coming from the upright bass. The guitar is well off to the right of the right speaker. This is the recording where the Pioneers first catch my ear. There’s a pleasing balance to the upright bass in the mix. The twang of the strings is palpable. There’s a subtlety and breathiness to Getz’s sax, as I’m sure is intended. The depth of resolution and detail in the guitar is appealing. There’s an overall roundedness of the ensemble soundstage. The Wharfedale is very smooth, too. It’s slightly less dynamic than the Pioneer, it would seem. The sax is appropriately forward in the mix, and it’s nice and breathy. I’m hearing a somewhat larger presentation compared to the Pioneer. There’s a nice, wide soundstage. There are lots of things to enjoy about this presentation. If anything, the Wharfedale errs on the side of softness versus brilliance. I am excited to hear what the KEFs would do with this recording. The sound strikes me as very natural and balanced compared to the first three pair, with the same rounded presentation as the Pioneers, a forward sax, and bloomy detail in the guitar. The guitar overtones make for a pleasant listen. I immediately notice that the sax is further back in the mix. The Elacs don’t sound any bigger than any of the other speakers, except possibly the Daytons. They’re nicely detailed and not at all a bad choice for this kind of music, but not my pick in this group. The extra bass offered by the B6 is appropriate, though somewhat overbearing. The vocal seemed to be too far back in the mix – characteristic of the Elac on other material I’ve heard so far. The vocal is more appropriately forward as compared to the Elac. 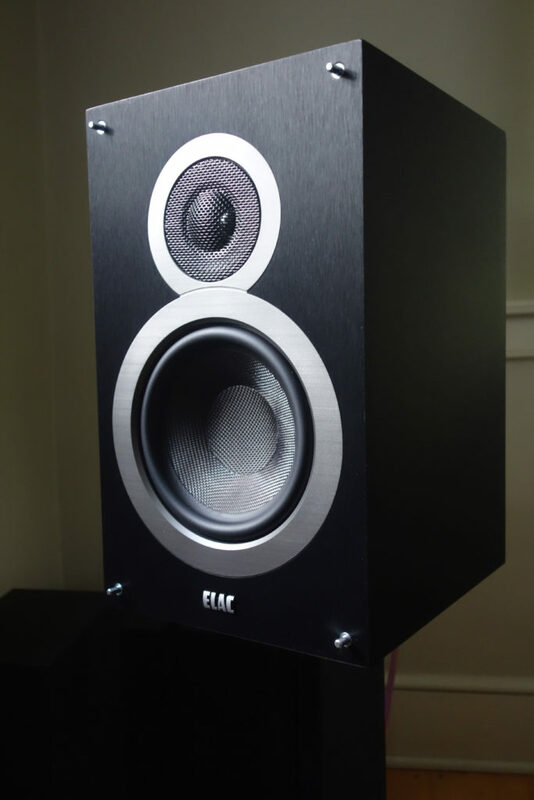 The KEF is much more neutral and natural-sounding than the Elac. There’s plenty of low-end. The KEF sorts out the climax of “Send my Love” nicely. The piano is realistic & deep on “Hello.” Some bassiness compared to the others is present here on “Hello.” The vocal is well delineated and solid, positioned above the plane of the tweeters, nicely featured in the mix. The dynamics a bit flat through stronger passages of “Hello.” The Wharfedale once again shows itself to be a capable and intriguing speaker. Vocals are crisp. There’s nice depth and overtones on the piano on “Hello” – similar to the presentation of the Wharfedale. 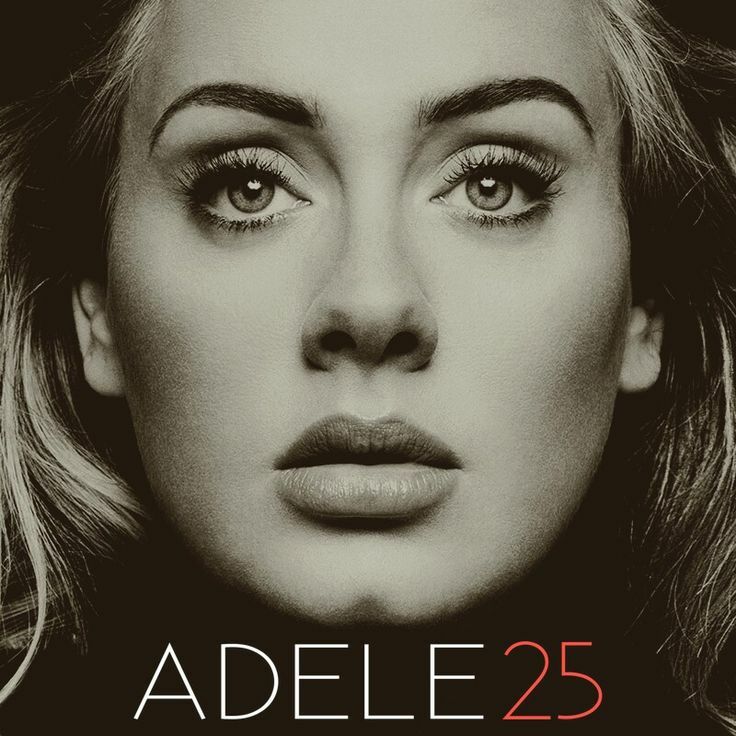 The Pioneers are every bit the match for Adele’s dynamic range. As expected, they’re less bassy than the Wharfedale, but they have more strength than expected in the lower registers. They really wanted to be played LOUD. I still can’t get over how much speaker Dayton packs into this $49 package. It’s quite an achievement. The piano is a bit more one-dimensional as compared to the other speakers. Overall, it’s a big, lush presentation. Completely listenable. The low end is nicely rolled-off. There’s no noticeable exaggeration. The Dayton would be my #1 choice for this LP if it weren’t for slightly less bloomy piano. Again for this track, I listened in pure two-channel configuration, with no subwoofer. This is good old two-channel listening at its finest. 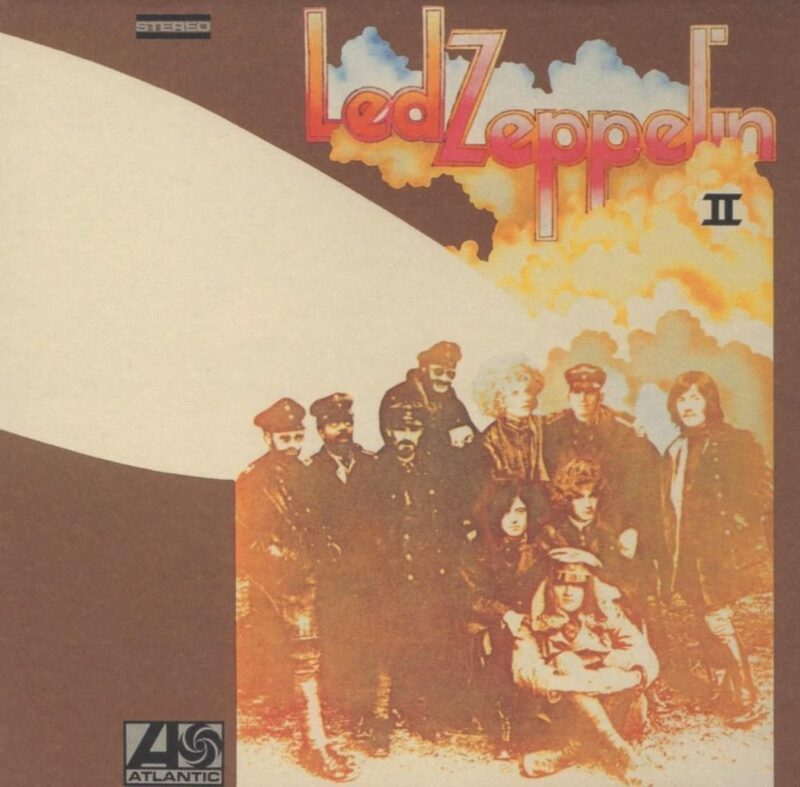 I love the warbling quality of Jimmy Page’s lead guitar. The Daytons aren’t painting a super-deep soundstage. There’s plenty of instrument and vocal separation. On this track, the Pioneer has everything I like about the Dayton, but with extra presence, breathiness, and separation. I actually liked Page’s lead guitar better on the Dayton, however. 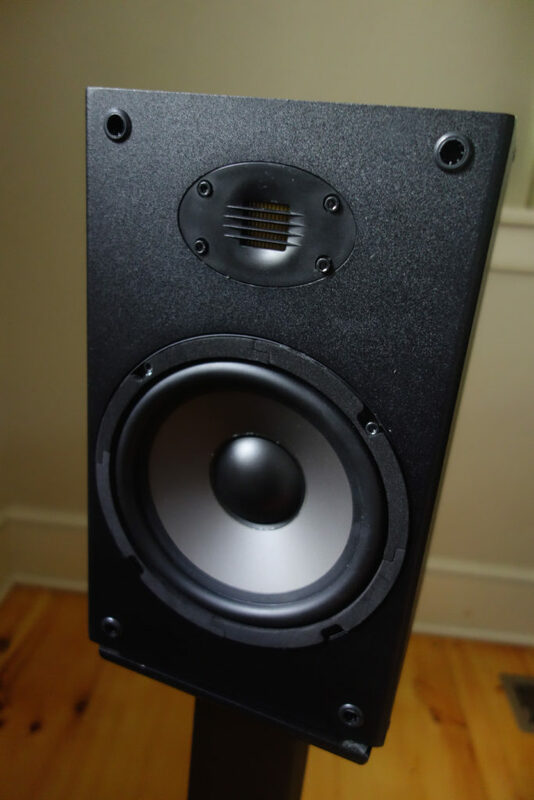 The Wharfedale is a touch more smoothed-out than the Pioneer and Dayton. There’s a little too much blending of instruments. The Pioneer and Dayton offer much better image delineation. I didn’t notice the slightly bloated basiness from the Wharfedales on this track that I’d heard on others. There’s not quite enough shimmer. Still, there’s a nice broad soundstage. I can hear the pitter patter on the wastebasket percussion. Image source separation rivals the Pioneer. 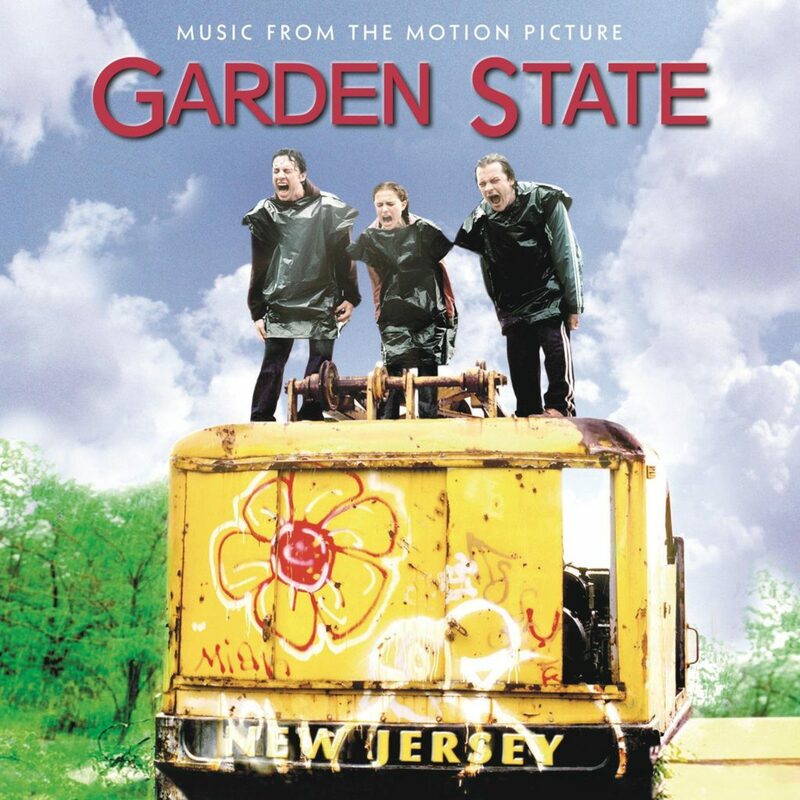 I’m used to Robert Plant’s voice being set back in the sound stage on this particular track, but the KEFs put him way down the hallway, with lots of air around the vocal, as if he’s pleading with the music. There’s tons of detail at lower volume levels – one of the real strong points of the KEF. The Elac seems to smudge the instruments together. It doesn’t convey the excitement of hearing clear delineation of sources. Robert Plant sounds more like he was singing into a paper towel. Again the mid bass stands out too prominently. These are all excellent-sounding speakers. Most would make just about anyone happy with their purchase. In articulating the differences, some would say I’m splitting hairs. The KEF Q100 won the most firsts and seconds (in my subjective ranking), but will it stand up in a long-term listening review? The Pioneer and Dayton Audio placed higher than expected, given their very affordable price. Between these two, I’d say the Pioneer SP-BS22-LR is more articulate and satisfying overall. The Wharfedale Diamond 10.1 managed one first place, and while it’s a very enchanting listen, I’ll remember the bass as being less smooth than the others in this group. I was surprised to see the Elac B6, which has been so thoroughly praised in the media, consistently at the bottom of the list, but this may be testament to the overall high quality of the entrants in this group. How will it fare in long-term listening? Over the next six months, I did my listening in a smaller room that has a lower ceiling (24′ long, 12′ wide, 7′ ceiling). The walls are plaster-over-stone, and the floor is pine over joists space 2′ on center. This is almost 200-year-old-construction we’re talking about. 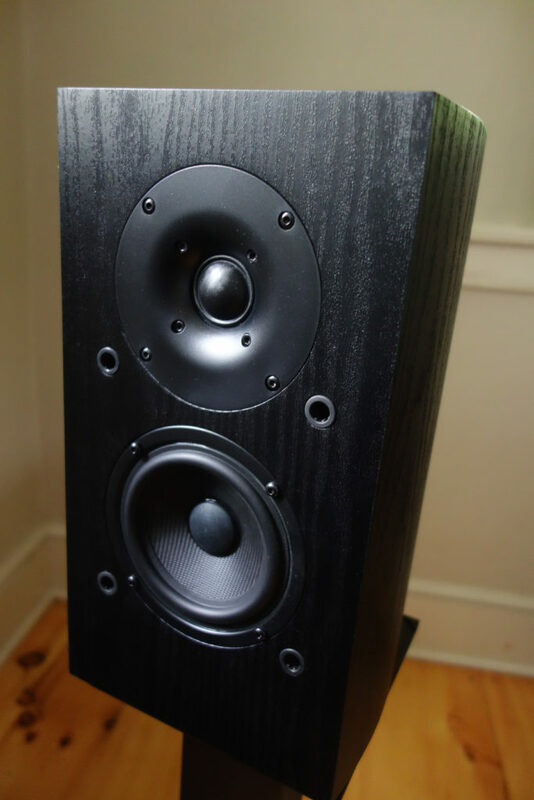 Given their high standing in the A/B comparison phase, the KEF Q100 and Pioneer SP-BS22-LR made it to this round, along with the Elac B6, which I was hard-pressed to abandon, given its glowing reviews elsewhere, along with its ability to play loud and deep. I left the Denon AVR behind, and used the Rotel amp and a Bluesound Powernode 2 I had on hand for review. The KEF Q100 continued to be enjoyable, but bright and fatiguing to the ear over extended listening periods. I can understand how it did well in the first phase of testing, when I was listening to it one track at a time, and then listening to other more gentle speakers before I came back to it again. I still appreciate the detail and the pinpoint accuracy of soundstage, and will set it up on occasion if the material seems to call for it. Vocals can be eerily present in the room. I talk more about its capabilities in my Magnepan MMG review, which came early in the long-term listening round. KEF Q100 settles in as my third favorite, but it’s still an awesome speaker. The Pioneer SP-BS22-LR is a brilliant and qualified speaker in a tiny and affordable package. And to think I picked up this pair for $65 at Best Buy! I love the big, broad soundstage and delicate articulation. There’s loads of room around the instruments, a surprising amount, actually. It’s not a fussy speaker at all, and I’m comfortable listening to it for extended periods of time, provided I’m not pushing the volume too high. Second place in long-term listening goes to the Pioneer SP-BS22-LR. That leaves the once-beleaguered Elac B6. How could it have rocketed from last place in A/B tests to first place in long-term listening? Perhaps it needed a longer break-in period. Perhaps it responds better when driven by the Rotel or the Bluesound Powernode 2 as compared to the Denon AVR. You can read more about how much I enjoyed it in my Bluesound PowerNode 2 review. It’s now my favorite of the bunch for a range of material. It sounds far more articulate than I remember it sounding in those early sessions, and it plays deeper and louder than any in the bunch. I love the dark, rich, chocolatey sound. I’m thinking about upgrading the stands. The Sanus stands seem a bit too flimsy for a speaker this large and heavy. It’s fun to have all these speakers on hand, but if I’m forced to keep but one, it’ll be the Elac B6, my pick for best affordable smaller speaker based on how much I’ve enjoyed it and how often I’ve turned to it over the others in the past six months of more casual listening.